Halloween is approaching - or Samhain, as many witches like to call it. Many witches also consider the festival at the end of October, when the veil between the worlds is thin, as a good time for scrying and divination. Crystal balls and obsidian mirrors are the perfect thing to gaze into by the light of the moon or the glow of a candle to seek answers to questions or perhaps glimpse what the future might hold. But crystal balls and obsidian mirrors are expensive, so here's how to make your own ball or black mirror to use at Halloween - or any other time of the year. Doreen Valiente in her book An ABC of Witchcraft describes one method. You just need a round, concave piece of glass – like the glass from the front of an old clock - and some black paint. She says you should put three coats of paint on the convex or upward-curving side of the glass, ideally while the moon is waxing. There was a new moon in the early hours of this morning, so the moon is waxing - or increasing - from now until the full moon on October 24th. The night when the moon is full is a good time to consecrate your mirror by cleansing it and dedicating it to its purpose. 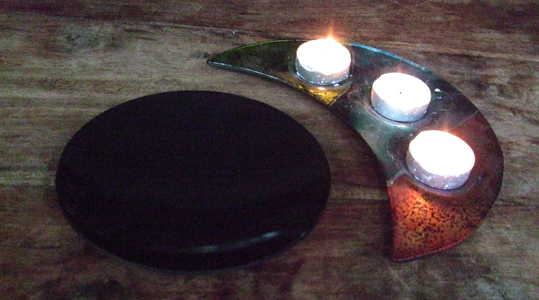 Then you can start to use the concave side for scrying, by looking into it and seeing if it has any messages for you. Doreen says this should only ever be done at night and that the mirror should never be exposed to direct sunlight after it has been consecrated. I made the one you can see in the photo at the top using that method at a magic mirror workshop I attended earlier this year. I'm really pleased with it and have found it to be an excellent addition to my witchcraft tools. 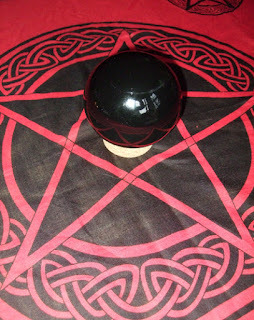 Last week, I used a similar technique to make a dark scrying ball - which you can see in other photos on this page. 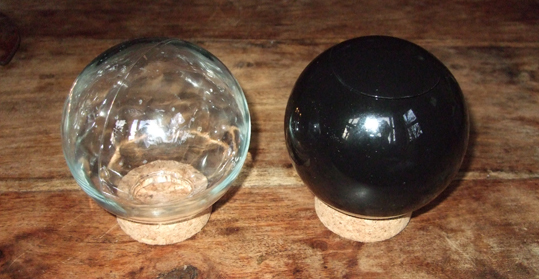 I found two spherical glass jars in a charity shop and I immediately thought they could be used for divination. I kept one clear, but the other I sprayed with two coats of black paint on the inside. It seems to work pretty well. Some witches prefer looking into a concave black mirror for psychic work, but others prefer to focus on the convex surface of a ball. Neither approach is right or wrong, it is just a matter of finding out which works best for you. If you have a go at painting a glass object to turn it into a scrying device, make sure you do so outdoors or in a well ventilated room. Put plenty of newspaper down before you start and wear rubber gloves, as the paint does make a bit of a mess. Leave each coat to dry thoroughly too. You can view An ABC of Witchcraft on Amazon.